Do I need to say how beneficial the good-quality drill bits are for stainless steel? They are useful to bore drills on the stainless steel surfaces as well as other types of hard metals. Cutting through the hard material like a stainless steel is not an easy task, but if you have the best bits, then it will become easier. Here, I will provide the filtered list of the most sought stainless steel drill bits. 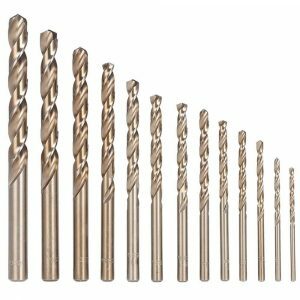 There are different types of drill bits are available in the market like high-speed steel, titanium, cobalt, etc. 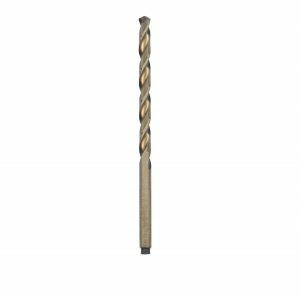 A top quality drill bit cuts through the hard metal without damaging the surface. Various types of drill bits come in different types of designs, sizes, shapes, and coatings for handling particular types of tasks. So, you need to pick up the right tool for your project tool. This high-speed titanium steel drill bit from Neiko is ideal for the novice users. You can use it on the electrical cabinets, galvanized surfaces, and also on the stainless steel surfaces. Its ease of operation and durability makes it the best product in the market. It has a self-centered 135-degree split point tip which prevents walking during operation and keeps the drill on one point. The classic high-speed steel mixed with titanium material is capable of working on various types of surfaces like aluminum, copper, stainless steel, etc. It securely fits into the compatible power tools without slipping through the tip. This self-starting drill bit requires no extra punching while in use. Its unique two flute design clears the chips quickly for a convenient operation. 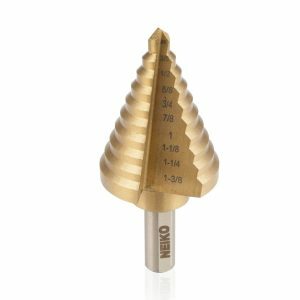 At each drill bit stop, you will be able to calculate the hole, so you will not drill bigger than you need. Its ten step sizes include 1/4-inch, 3/8-inch, 1/2-inch, 5/8-inch, 3/4-inch, 7/8-inch, 1-inch, 1-1/8-inch, 1-1/4-inch, and 1-3/8-inch. The 63137 from Irwin Industrial Tools is a fifteen-piece set of high-quality drill bits. The heavy-duty construction of these units makes them ideal for the drilling on the hard materials. They are fractional straight shank jobber length set of drills. The 135° split point on the bit minimizes the pressure for a convenient penetration. These drill bits are made from M-42 5% cobalt high-speed steel which delivers high resistance in tough metals & stainless steel surfaces. The short cuttings lips will reduce the torque while drilling on the superior tensile strength surfaces. Its distinct spiral flute design generates quick ejection of the chip. There are five sizes and four styles available to pick up your desired toolset. An included carrying case will help you to store the bits conveniently while not in use or during travel. DEWALT offers this high-quality cobalt pilot point drill bit set for a maximum drilling speed and durable life. If you are a professional who needs frequent drilling operations, then this high performing drill bit is for you. This set consists of 14 drill bits of different sizes for handling your particular needs. The split tip design will not let the bit walking while drilling and keeps the point at one spot. This drill bit has cobalt material which helps to drill through hard stainless steel quite easily. Its pilot point with split tip design will not let the drill slip from the drilling point. 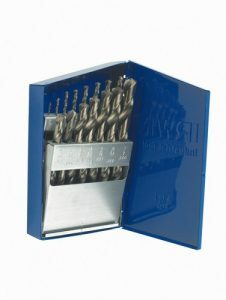 It is a perfect drill bit set for the stainless steel and other hard metals. 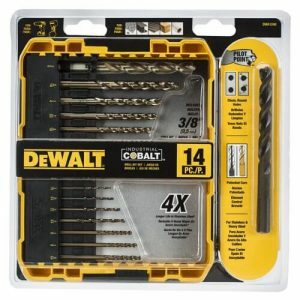 Even though it provides faster and safer operation compared to the other drill bits in its category, this DEWALT product is available at an affordable price. The 10005 HSS industrial grade drill bit set from Hiltex is a great tool for drilling on the hard material like stainless steel and hard metals. It will deliver efficient operation and will stay for a longer time compared to the other standard drill bits in its category. It has a high-speed stainless steel material which means you will have an accurate, fast, and clear output in your drilling jobs. The black enamel coating on the heat-treated carbon steel offers heavy-duty and durable operation. The 135-degree split point gives precision control and quick penetration. 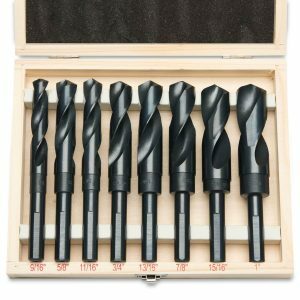 This 8-piece set of drill bits includes the sizes of 1-inch, 15/16-inch, 7/8-inch, 13/16-inch, 3/4-inch, 11/16-inch, 5/8-inch, and 9/16-inch. All the pieces come in a sturdy storage case to keep them safe while not in use or during travel. The Bosch CO2139 cobalt is ideal for drilling to handle the electronic projects containing stainless steel surfaces. You will be able to make modest holes with little efforts and less time. Apart from its useful characteristics, the affordable price of this unit makes it a preferable choice among the users. There are nine different sizes available of this drill bit including 1/16-inch, 1/8-inch, 11/64-inch, 13/64-inch, 3/16-inch, 3/32-inch, 5/32-inch, 5/64-inch, and 7/64-inch to allow you for choosing the suitable unit according to your need. Its rigid and thick design will make it stable even in the toughest applications. It can withstand against the temperature of up to 1100° F.
You will get a perfect drilling operation on the surfaces like high-carbon steel, cast iron, stainless steel, light-gauge metal, titanium, and aluminum & ally steel. 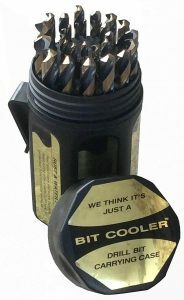 Its hardened surface makes it durable almost four times more than the standard metal drill bits. The M35 cobalt steel drill bits from Migiwata are particularly useful for cutting hard surfaces like stainless steel, metals, and cast iron. They provide a convenient and time-saving operation on the soft materials too. This set consists of 13 pieces of cobalt drill bits for handling different kinds of drilling jobs. The cobalt steel and molybdenum material together create a hardened alloy for getting the hardness of up to 67 and making it extremely resistive against heat. It has a 135-degree quick-cut point with a self-centering feature for ensuring quick penetration and less pressure. The 13 pieces of drill bits have sizes of 6.5mm, 6mm, 5.5mm, 5mm, 4.8mm, 4.5mm, 4mm, 3.5mm, 3.2mm, 3mm, 2.5mm, 2mm, and 1.5mm which will help you to use the right unit according to the drilling hole size. It has a double edge, cylinder bit body & right rotation with a fully ground processing technology which will deliver bright, smooth, and clear operation with a long lifespan of the tool. If you are not satisfied with the product, the company offers a 100% money-back guarantee within 90 days of purchase. 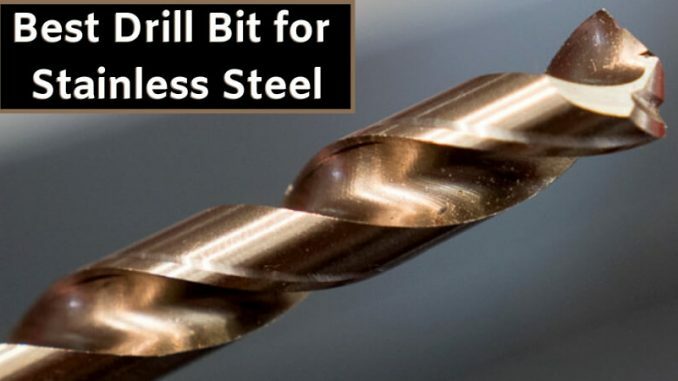 It doesn’t matter which kind of stainless steel surface is; whether it is a thin steel plate or your vehicle’s steel surface, this drill bit from Drill America will provide you a handy drilling operation. If you frequently drill on the low to medium tensile strength surfaces, then this product is the best stainless steel drill bit for you. You can choose from the three-piece sample set or a complete 29-piece drill bit set with a plastic case depending on your interest. This product is made from the high-speed stainless steel to provide superior hardness and stability. It comes with a 135-degree split point with a self-centering feature for a quick penetration on the hard material and to reduce clogging. The various sizes of drill bits you will get in this package are 1/16”, 5/64”, 3/32”, 7/64”, 1/8”, 9/64”, 5/32”, 11/64”, 3/16”, 13/64”, 7/32”, 15/64”, 1/4”, 17/64”, 9/32”, 19/64”, 5/16”, 21/64”, 11/32”, 23/64”, 3/8”, 25/64”, 13/32”, 27/64”, 7/16”, 29/64”, 15/32”, 31/64”, and 1/2”. All the pieces stored in an included plastic storage case to keep them safe while not in use. There are three main types of drill bit materials; HSS (high-speed steel), cobalt and carbide. The drill point length, angle, coating, and flute design are some other considerable factors while choosing the drill bit. Once you have decided to get the best drill bit for stainless steel, then you will just need to focus on the surface you want to drill. If you want to get the real value for the money product, then the above list will help you for sure. I have reviewed here the most sought drill bits from Bosch, DEWALT, Drill America, and other top brands. They will help you to get the right unit for making a perfect hole as per your needs. Let me know which product you liked the most and willing to buy for your job. You can also share your thoughts on the article through the comment section.